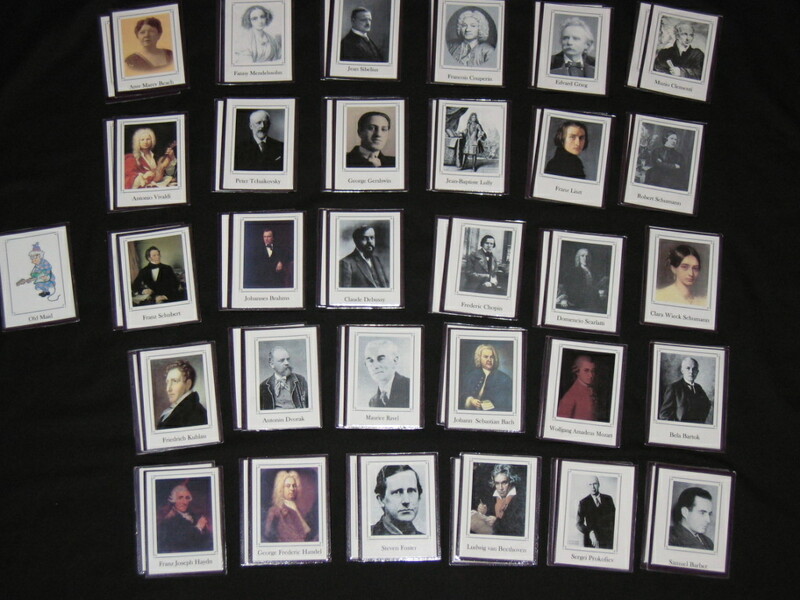 44 composers from the Renaissance to the present day are represented in these cards. One page has pictures of the composers, and the other side has the name, country, period, and an interesting fact about each composer. Cards can be printed front to back, or on separate pieces of paper. I chose to do mine on separate cards, mounted them on cardstock, and laminated them. It makes for great games of Memory, or add the Rockin’ Granny card for a game of Old Maid. If you need directions to play Old Maid, click here. Johannes Brahms :FOLK music ? Friedrich Kuhlau: THE piano ? Frederic Chopin: he WROTE ? DOMENICO Scarlatti: harpsichord. (Also photo) ? Oh, my. Some of those were downright embarrassing! Thank you SO much for pointing them out, Sue. I’m all for making things better! I really have been enjoying your website. I have a music ed degree, with special ed endorsements. Right now, I am teaching special ed; however, I like to look for resources, in case I teach music in the near future. When I tried to open the Composer Cards, it brings up the message that the file is damaged. Bela Bartok was not russian, however on the info card it states Russia. Béla Bartók was a Hungarian composer. Eep! Thanks for catching that for me, Lucy! It’s all fixed now. Modest Musorgsky was stylistically Romantic, not Contemporary. Thank you, thank you! In my first grade classroom we listen to “classical music” on and off throughout the day. Most of the time I “spotlight” a composer for a week, unless he/she was prolific. It is so exciting and rewarding to have a student say to me on Monday morning, “I heard Mozart on a T.V. commercial last night.” And, it is virtually effortless, requiring exposure to the music more than anything else. I have few pictures of the composers to post, and no facts past the vital statistics. Your hard work will help my students learn so much more. What a great idea, and you are very welcome! I just want to tell you, that I have on my list of games to create, “Composer Old Maid” and I have been looking for the perfect pictures/facts to use, and then I come upon your site and I almost screamed with joy!! Thank you thank you thank you for making this available!! I LOVE these cards, they are fabulous! You saved me quite some work. I really wish I could add the years of their lives and 1-2 most famous works. I understand it is extra work and I’ll be glad to help you with this if you don’t mind sharing the original file. I would appreciate if you send me an email. Hi, These look great! thank you so much for sharing them!!! I am having trouble opening the download – is there any way that you could email me a copy of the pdf? THANK YOU! THANK YOU! Your cards are fantastic! I absolutely love that you have included both contemporary and American composers. Our son is homeschooled and is diagnosed with autism these will be great to include in our study of the “masters.” I plan on blowing several of the up into 8x10s to hang on our wall and also play games of memory with them. Is there any chance you will continue adding additional composers in the future? Also, I hope you won’t mind but I would like to add a link to your site to a list of helpful sites for homeschooling on my blog if it’s okay? These are so gorgeous! Thank you so very much. Greetings from California! I’m bored to death at work so I decided to browse your website on my iphone during lunch break. I really like the information you present here and can’t wait to take a look when I get home. not even using WIFI, just 3G .. Anyhow, superb site! I’m an italian homeschooler mom and I would translate your cards, which would then be made available free of charge on my website Imparare in piedi, mentioning the copyright, of course. Do you give me the permission? Hi, I love these composer cards but when I tried to print them the words are all blocked or gobbledy-gook. How do I change this? Thanks for your help! Some really fantastic posts on this website, thank you for contribution. “A conservative is a man who sits and thinks, mostly sits.” by Woodrow Wilson. Love your helpful website. Can you include Bernstein somehow in the composer section? I’ve gotten fantastic ideas from your website. Where did you get your composer pics? I want a source where I can be confident that it is not against copyright to reproduce pictures.